Today we will discuss Rahu and Jupiter connection. We all know that Rahu is the bitter enemy of Jupiter. Though Jupiter has no bitterness towards Rahu but Jupiter is never comfortable with Rahu either in Lagna chart or Navamsha chart. Venus or Shukracharya is the bitter enemy of Jupiter or Brihaspati. Since Shukracharya ( Venus ) is the Acharya of Daanav paksh, Rahu being a Daanav, hates Brihaspati (Jupiter). 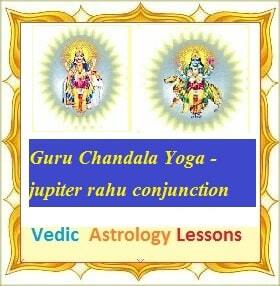 The conjunction of Jupiter Rahu in a chart is called Guru Rahu Chandal Yoga in Vedic Astrology. What is the effect of Guru Rahu Chandal Yoga? The first action of Rahu is to defame the person. The second action of Rahu is to expose the person before the society. Rahu takes the revenge of his Acharya. Rahu is attacking all the portfolios of Jupiter in one’s life. Jupiter is the main ruler of child birth, children’s and also male issues. Rahu affects this aspect in one’s life in different different ways as per past Karma’s of native. Sometime no male issue, Repeated miscarriages, misbehavior of Son and much tension from Son in old days. Sometime daughter creates problems by her inter-caste relations or relations with a married guy where father is helpless and his name is spoiled in society. Jupiter also is a planet of happymarried life. Rahu pushes some female in the life of a native who has Jupiter Rahu in his chart and disturbs married life and gets defame in society. Jupiter is the ruler of Education. Rahu interfere in academic aspects and diverts the mind of the native when he is preparing for important examinations like 10th, 12th and final degree exams of colleges. Trials and trials in CA exams is also Rahu effect. Jupiter is the ruler of 2nd and 11th house. 2nd is family and bank balance. 11th is income sources and turn over. Rahu Jupiter if combined in a chart, the person can not enjoy happy family life. He has some issues in family. In money matters, he can not save money much due to sudden unexpected expenses. Some incidents and circumstances compels him to take loans and installments never end. In business too, turn over is ceased or affected whenever Rahu transits over Moon or over Jupiter or in 12th house from Moon. If chart is heavily afflicted then native becomes bankrupt. Now when all this happens mostly ? Yes in transit when Rahu catches Jupiter or Jupiter is transiting the Sign where Rahu is seated at birth time. Vice versa. When Jupiter antardasha comes in main Rahu dasha or Rahu antardasha comes in main Jupiter dasha the period is totally upset. This period is roughly around 2 years 4 months and it is the WORSE phase in everybody’s life. If Rahu Jupiter joined at birth time then this is the WORST phase of life. Rahu takes the charge and locks the income sources, creates legal problems, gives allegations, exposes the native for any of his past mistake. Also he is in tensions due to his own kids problems. Rahu creates such a situation that native is indebted and he faces defame and fear too. One thing I would add at conclusion that whatever I have mentioned above will not be the same result in all charts. We have to consider the strength of the chart and other good factors too if any in the chart. Density of the above results may be different from person to person but Rahu Jupiter combination in birth chart and Rahu Jupiter Dasha antardasha do affects heavily in everybody’s life . At the same time I have studied the charts of some Companies from the date of Incorporation and found that those companies who were established when Jupiter Rahu were very close have suffered big downfalls in their share prices. So we should avoid such combinations when we start a new business or construction schemes or form a new Company !!! Now Rahu has entered Gemini. So those natives who have Jupiter in Gemini will suffer above results for one and half year. They should be careful in financial dealings. Students of 12th who have Jupiter in Gemini may also get less percentage in the result so they will face problems for admissions in choice stream or colleges.